Christmas arrives with a warm overjacket on its shoulders. At night it brings warm light of the first evening star and in the morning it wakes you up with shine of white but warm sun. If my great-grandmonther’s grandmother had been asked about her Christmas feelings, I believe, her words would have been identical to mine. Because together with a bowl of kutia, generations of Ukrainians transfer their traditions from hand to hand. Traditional Ukrainian Christmas wiped windows of calendars with its mittens to mark all 13 days of its stay - from Christmas Eve on January 6 to Theophany of Jesus Christ on the 19th. Back in the days they used to prepare for holidays in advance. They cleaned houses and surrounding territories, and by whitening houses they gave their dwellings new clothing to fit show-white piles and welcomed holidays wearing new looks. They never forgot outfits for the family, too, stored up fabric in advance, embroidered ornamentation with cross stitches at taught kids and youngsters various kolyadkas and shchedrivkas in the meantime. Christmas Eve that comes right before Christmas, on January 6, is a good time to have some culinary art practice because there should be as much as 12 dishes on the table, all Lenten only. 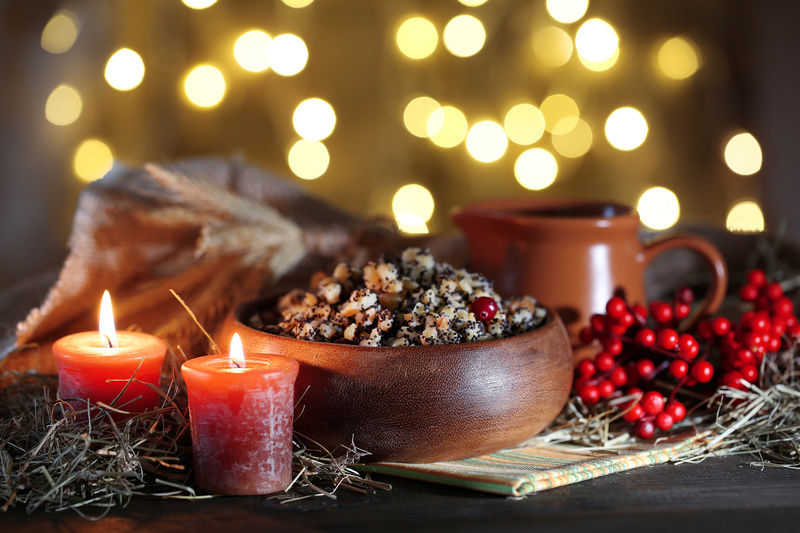 The finest bowl this night is taken by kutia – mush made of cereal grain, it is it that the treat starts with. When somebody lightens first shimmering star with a Christmas match up there in the skies, only than it is allowed to have the first spoon of food in a day. Together with the family that attempts to gather in full muster on this day of all others, spirit of forefathers, didukh*, joins festive dinner. It is brought into khata as the star begins to shine however it is assembled long before Christmas holidays from last harvest’s cereal ears. When adorning it for the dinner, they put bead strings made of guilder rose berries on it, tie a tie made of colorful ribbons or decorate it with dried flowers. Didukh takes the most dignified spot – by holy images. The way it looks is a statement of respect towards ancestors and representation of immortality of the family, welfare and rich harvests. Christmas paints bright pictures: piles of white crunching snow, footpath winding among them from house to house, carved window shutters half-covered with white blanket after a snowstorm and bright spots of girls’ holiday kerchiefs in the endless sea of white: red as heat, green as grass, blue as cornflowers in the field. Chatter and clutter of girls catches up with deep voices of young men to join in Christmas kolyadkas and greetings for hosts. “We say good night to you, the master of the house…” (“Dobryy vechir tobi, pane hospodaryu..” in Ukrainian). 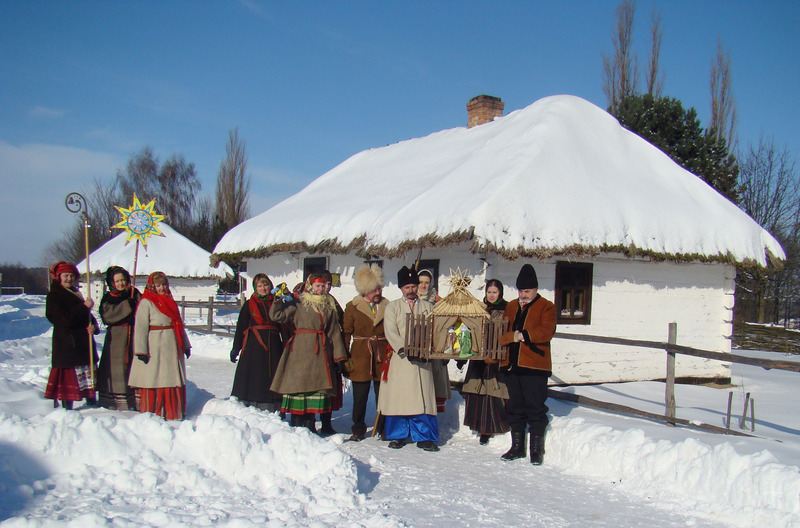 Different regions of Ukraine had own days for caroling. Some expected guests after Christmas Eve, others on the very Christmas day and some – even after that. 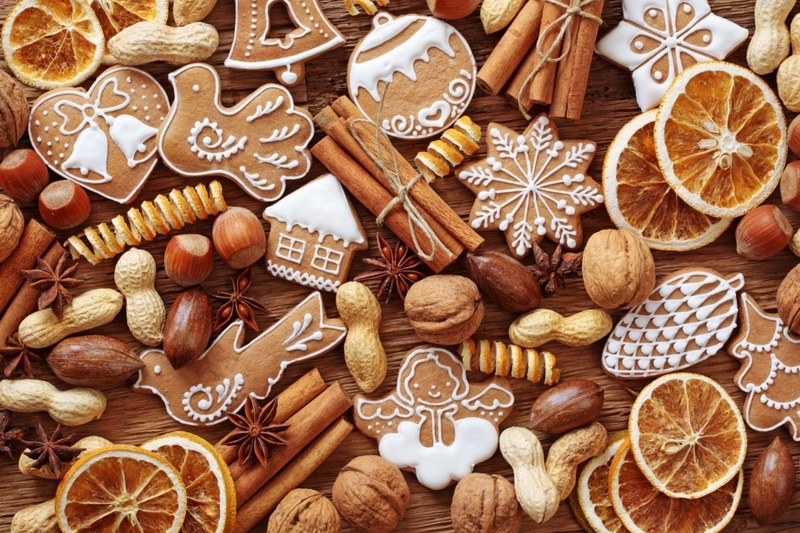 And each had own timing and direction: small children more often than not only visited neighbors to get sweets, nuts and other delights from hosts after singing. Adult boys and girls tried covering larger routes; they visited almost every khata in a village. Bethlehem start was a must-have attribute for all carolers; it was usually made of stuff at hand: mainly paper of yellow, orange or golden color and decorated with spangles, ribbons and lanterns. Christmas image could be placed in its centre. And sure enough there was no way a holiday could have gone without nativity scenes! Nowadays there is hardly a toy house that surprises. However back in the days people looked into small boxes that contained miniature decorations and characters that depicted Biblical story. Frequently those weren’t mere figures but a whole puppet theatre that developed into a live story thank to voices and skillful moves of actors. With time nativity scenes escaped small boxes so more and more often it can be seen with human-size characters. 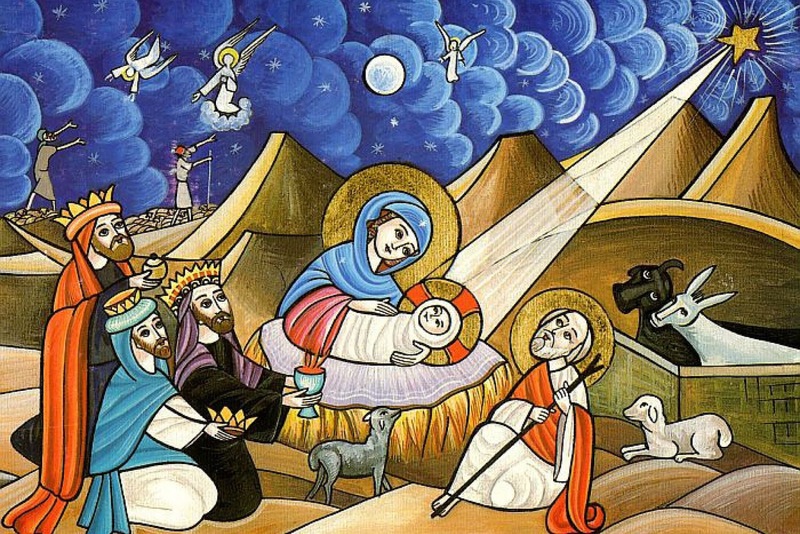 Theophany of Jesus Christ doted all the i’s of Christams holidays. 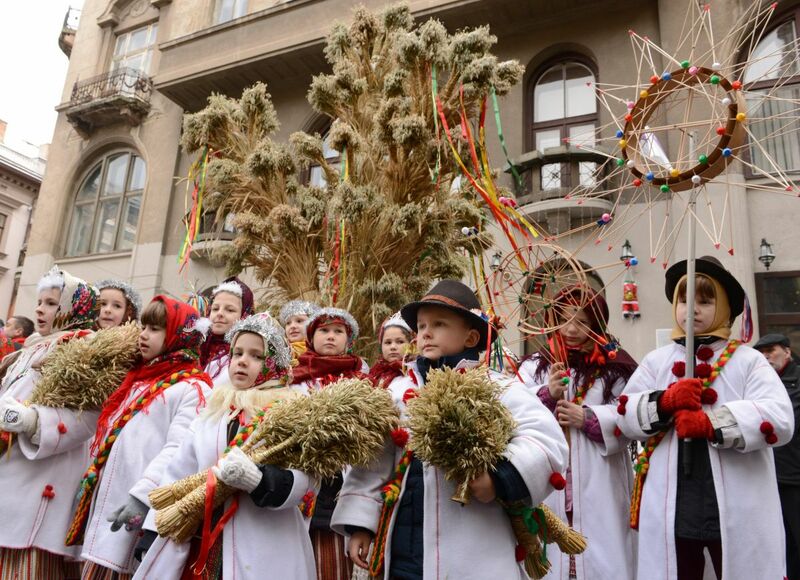 In its run-up Ukrainians celebrated Malanka holiday. On such days youngsters and teenagers hid behind masks to fall into personas of folk characters and animals for loud sounds of shchedrivkas to be heard in towns and villages till late at night.